‘Peace-building’ international organisations vitiated the economic course of post-Yugoslav countries by acting as periodical employers with no sustainable long-term strategy, argues Catherine Baker. This has occurred most of all in Bosnia-Herzegovina and Kosovo, where international intervention has taken place on the greatest scale. During the Yugoslav wars, and in Bosnia-Herzegovina and Kosovo especially, foreign peacekeeping forces injected significant amounts of hard currency into a wartime economy where locals depended on it to pay for black-market goods, as well as importing supplies for their own use that sometimes found their way on to the black market through peacekeepers’ complicity in illicit trade. 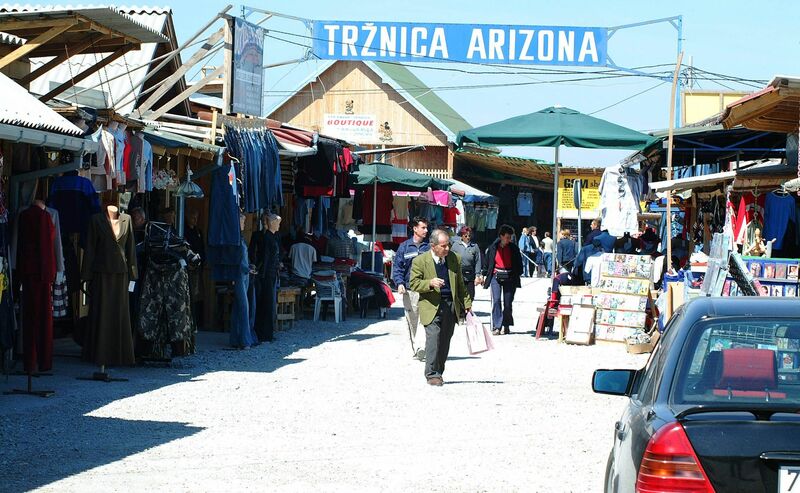 This type of complicity continued after the war, notably at Arizona Market, a trading area in north-east Bosnia which foreign donors had funded to encourage inter-ethnic reconciliation but which became a hub for tobacco smuggling and human trafficking, driven in part by demand from the foreign staff of international agencies working in the area. Yet international organisations also figure in the political economy of post-conflict societies in an even more direct way: they are the employers of thousands of ‘locally-recruited’ staff, on contracts that can only last as long as an international agency expects to stay. During the Yugoslav wars and for a number of years afterwards, the hard-currency wages for these jobs, and the likelihood that wages owed would actually be paid, made this work very well remunerated in comparison to the work available in the local private and public sectors. Indeed, so attractive was this work in the post-conflict economy that the term ‘locally’ recruited staff (as international organisations term the staff they have hired ‘on the ground’ rather than those recruited in the organisations’ countries of origin at much higher rates) becomes something of a misnomer: some prospective workers travelled from Croatia and Serbia to work for foreign military forces and civilian agencies in post-conflict Bosnia-Herzegovina, and likewise from Macedonia, Albania and eventually Serbia (not to mention from various national diasporas) to work in Kosovo. The thousands of people who have worked in jobs like these for varying lengths of time since 1991 have experienced quite distinctive employment conditions and distinctive socio-economic positions as a result. The short-term-ness of their employment, and (in many but not all cases) the lack of any health care provision even for employees who are injured at work, has created a specific form of precarity, albeit offset by the advantages that the skills, experience and contacts they gain may have provided them in realising other aspirations after they move on from the work. This could suggest that they could be thought of as another specific social group that has arisen from the wars, just as there is recognition of veterans, bereaved mothers, ex-prisoners, refugees and many other such groups in the post-conflict ex-Yugoslav societies. Workers employed by international organisations often form close friendship groups that endure long after the work has finished. Yet there is less sense of a large-scale social identity derived from having worked in the ‘international organisations’ sector: there is not even one suitable term in Bosnian, Croatian or Serbian that refers to them all. Academic literature on the political economy of peacebuilding, similarly, may discuss the international organisations sector in the context of economic growth, but not in the context of the success or failure of job creation, despite the effects it has had on the life courses of its employees. They could simultaneously be part of a ‘precariat’ (if such a thing exists) and part of a ‘projectariat’, that is, a relatively privileged elite composed of international organisations’ local staff. At the LSEE research seminar I gave in January 2014, I discussed some of the reasons why this employment sector and this group of employees may not have been recognised as such. One is that the ‘locally recruited’ workforce has had a hierarchical structure of its own, containing jobs that range from unskilled support work to much more professionalised roles. While mobility up the scale of jobs and pay grades was possible, usually only workers who already had the skills needed for the higher-level posts were able to ‘work themselves up’, meaning that existing factors of social stratification would be reproduced in who had access to what roles. The sector itself is also fragmented, containing multiple organisational practices and cultures, including but not limited to a civilian/military divide. That said, people working in this sector have often switched between several different kinds of organisation as contracts expire or agencies relocate, and good references from one international employer are an advantage when applying to work for another. Some broader sense of ‘sector-ness’ does therefore arise. Besides these explanations, there is also the problem that working for international organisations has turned out to be less of a profession, more of an expedient – because it was the highest-paid work available, the only work available, or a worker’s original career intentions had been destroyed by the break-up of Yugoslavia and the wars. Working in the sector is often not an aspiration, more of a temporary stage, even if for many workers that temporariness has become ongoing. Moreover, the building of social solidarity among occupational groups has not been a priority for civil society promotion initiatives within internationally-driven peacebuilding. By failing to prioritise social security and unemployment in their agendas, peacebuilding agencies have offered no incentive for local political elites to address these themselves. The demands that have emerged from citizens’ plenums during the protests in Bosnia-Herzegovina express widespread public anger at politicians for privatising public enterprises in the interests of their friends, awarding themselves payments well above the average wage, and restricting jobs in health and education to people with the right connections. More action might have been taken on these problems before now if peacebuilders had not left them to the market to reconcile. It seems that even the organisations that have employed locally-recruited staff put little thought into how these posts would affect the socio-economic landscape. A study of ‘local’ recruitment in Sarajevo during the early 2000s by Sultan Barakat and Zilha Kapisazović found that many organisations expected their staff might start up their own businesses after their contracts had run out. The workers themselves, however, did not feel they had the right knowledge or the start-up capital to do this, and instead expected to seek work with a different employer inside or outside the country. The agencies had no firm strategies for how the workers they had employed might contribute to the change that those same agencies intended to bring about. This is a paradoxical combination of long-term aspirations and short-term thinking for organisations that have sought to transform and stabilise a country. The ‘international organisations’ employment sector has declined in socio-economic significance since its immediate post-conflict heights, but has not gone away. The need for greater awareness of these organisations as an employment sector should be felt not only by researchers but also by the organisations themselves: for all the language of ‘capacity building’, there has been remarkably little thought about the capacity that they themselves have built. Agencies in future interventions will need to drastically improve their planning in this respect in order to mitigate the precariousness that they have contributed to in the former Yugoslavia. Dr Catherine Baker is Lecturer in 20th Century History at the University of Hull. She previously worked as a researcher on the Languages at War project at the University of Southampton and as a Teaching Fellow in Nationalism and Ethnic Conflict at the UCL School of Slavonic and East European Studies. Catherine has parallel interests in media, culture and nationalism and in international intervention, and this blog post summarises arguments from an article she has recently published in International Peacekeeping and presented at LSEE. She blogs at bakercatherine.wordpress.com and tweets @richmondbridge. This entry was posted in Bosnia and Herzegovina, Kosovo, LSEE events and tagged Arizona Market, Balkans, black market, Bosnia, Catherine Baker, employment, human trafficking, international intervention, international organisations, jobs, Kosovo, labour market, precarity, protests, tobacco smuggling, unemployment, Yugoslavia. Bookmark the permalink. A dimension not mentioned here, at least in this short version being presented on the website, are those from that generation of the workers recruited by the international aid organizations who have managed to become fully fledged expat professionals themselves. From finance, to conflict resolution, and other posts – I know a number of people from the region of ex-Yugoslavia who have made that transition. I would have loved to have seen more of that aspect discussed.